I like the way the cardamom and orange seem somewhat silent in the cold ice of this delicate yoghurt sorbet: they are there – but only just – dancing around the edge with a subtlety that just begins to warm the whiteness. 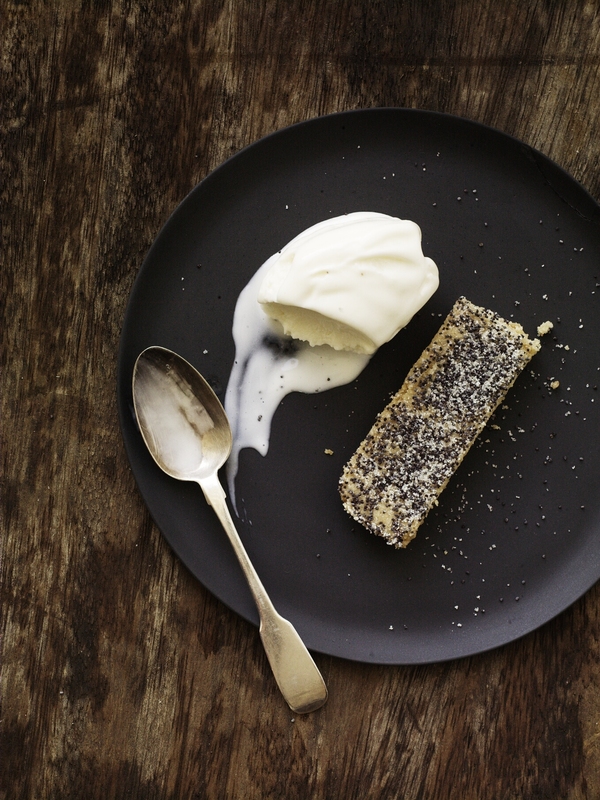 The brown butter biscuits have richness to their crumb and the tiny poppy seeds pop and bite against the smooth sorbet. To make the sorbet, place the sugar and honey in a small pan with the cardamom pods, the orange zest and 4 tablespoons of water. Place over a low heat and bring the liquid to a gentle simmer. Cook for 3–4 minutes, or until the syrup begins to thicken slightly. Remove from the heat and set aside to cool. Put the yoghurt in a mixing bowl. Strain the syrup through a sieve onto the yoghurt and whisk thoroughly. Pour into an ice-cream machine and churn until soft set. Transfer to a plastic container, cover and place in the freezer until frozen (about 3–4 hours or overnight). To make the shortbread, heat the oven to 170°C/325°F/gas mark 3. Place the butter in a pan over a low–medium heat. Shake the pan once in a while to stop the butter spitting. Cook for about 5–6 minutes, until the butter smells fragrant and nutty and you see the solids browning on the base of the pan. Skim any foamy bubbles from the top. Place the sugar in a bowl, then pour over the butter, leaving the solids in the base of the pan; mix well. Combine the flour, cornflour and salt in a separate bowl, then add to the butter and sugar mixture. Use a spatula to bring everything together to a soft dough. Spread the dough evenly over a non-stick 25 x 15cm (10 x 6in) baking tray, pressing it down with a spatula to level it. Bake in the oven for 15–20 minutes, until golden. Remove from the oven and sprinkle with caster sugar and the poppy seeds. Use a knife to score the biscuit into rectangular fingers. Allow to cool. Remove the sorbet from the freezer 15 minutes before serving it – a spoonful per person with a crumbly biscuit alongside.